Within the Raedwald Trust, we are committed to equal opportunities irrespective of race, religion, gender and/or SEN. Our aim is to meet the needs of all young people on our role with due regard for the guidance in the SEND Code of Practice, 2014. The majority of our pupils are referred into the Trust through IYFAP (In Year Fair Access Panel) which is held monthly for both primary and secondary schools in Suffolk. The IYFAP is chaired by the Local Authority (LA) and attended by Head Teachers/Senior Leaders as well as Multi Agency Professionals. Pupils are referred into IYFAP by the school on which they are on roll, with additional information submitted when appropriate. The Pedagogical Lead for Raedwald Trust attends all IYFAP meetings and determines (working collaboratively with the LA, schools and external agencies) whether or not a pupil is a suitable referral into the Trust. A list of pupils who fulfil the criteria for the Trust are collated and then home/school visits occur to determine which provision would best suit the needs of each referral. Families are then informed and pastoral leads initiate formal contact from the allocated site. Referrals and admissions into the Raedwald Trust occur throughout the year. 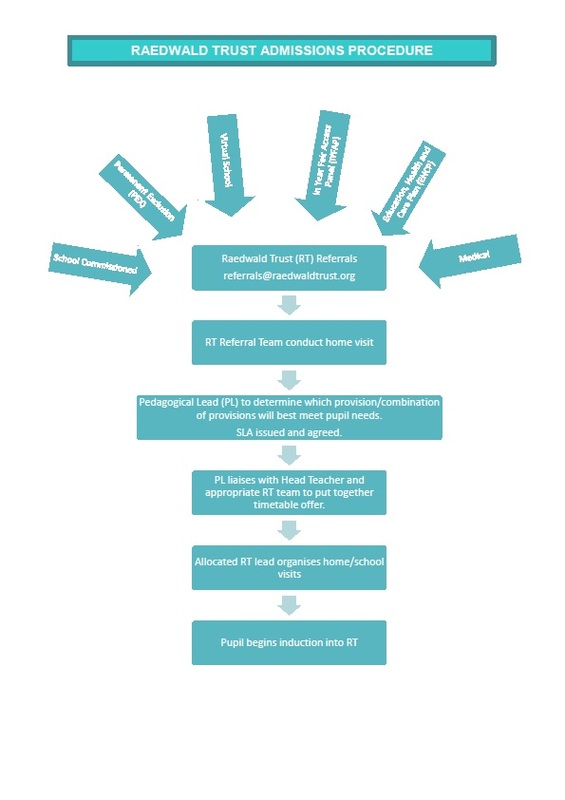 Schools wishing to directly commission the services of the Raedwald Trust outside of the IYFAP route above should follow the process in the flow chart below.